…and even though I walked the entire length of the aisle and touched several awesome pieces, I kept coming back to the Theory print. Now don’t get me wrong, Mood doesn’t just have wonderful designer cottons in the NYC store, there also some pretty ones online too. Some that would work just as well as the one I chose for my first skirt of the summer. See I wasn’t originally going to make a skirt. I was going to go with my fave garment, a dress, but the weather here on the East Coast has been horribly hot…and the other day I wore a print cotton pique skirt, a tank top and a little cardigan to work and it was perfect. Perfect for the manufactured cold of the bus and my office, yet when I removed the cardigan it was perfect to walk the streets of NYC and to ride the subway. So even though I originally imagined this as a dress…on the cutting table it became a skirt. Now here’s the sad thing about me sewing for years and years. I have pattern favorites or tried ‘n true (TNT) patterns that I like to use. I mean they work for me. I’ve probably made dozens of them over the years and honestly I see no reason in switching up now. 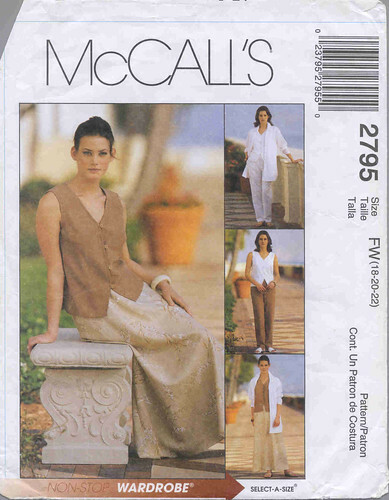 So here is the original pattern that I altered to get my current skirt pattern – McCalls 2795 with a copyright date of 2000. Not as old as some in my collection, but a great workaholic pattern, just the same. As you can see, I’ve paired the skirt with a solid color RTW tank top and a lime green RTW cardigan. I think this color combination screams summer yet it works in my conservative work environment that lightens up just a little for summer. Construction was easy because it has an elastic waistband…good for us waistline-challenged women! I added a lining and I machine stitched the hem. It really is the fabric that makes this skirt sing. It is a great addition to my wardrobe. I love the colors, florals are really big this summer, and it will be wonderfully easy to wear, especially in this hot, humid and steamy weather we’re experiencing now on the East Coast!